The Pro version of our newsletter plugin allows you place different subscription forms to your site and collect subscribers into different mailing lists. This feature suggested a cool idea to me that I want to share. Using this capability of the Pro version you can easily find out the best place for the opt-in form on your website to get the more subscribers possible. So, if you are hesitating about whether to add the signup form to the side bar, or inside the page, follow our advice to see where your opt-in form works better. The idea is to create, for example, 3 lists, add 3 subscription forms – at the side bar, inside the page and in the header – and monitor the number of subscribers. To create a new list, go to your WordPress admin and click on “Subscribers” under WPNewsman Pro. Select “Add new” in the “List” menu. Type a list name, for example “Sidebar”, and click “Create”. Select the “Sidebar” list from the menu and click on “Form & List Options”. Modify the submission form if needed and click “Save”. If you already added the subscription form to the side bar, go to Appearance -> Widgets and assign the “Sidebar” list to the form. Now go to WPNewsman Pro -> Subscribers and create a new list. Call this list “Page”, for instance. where id will be your form ID. Now you have two forms and two lists. 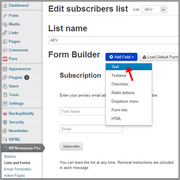 If you want, you can add the 3rd list and form and put the form in the footer, for instance. Make sure the forms are identical. To send a newsletter to all the lists at the same time, simply select all lists in the To field when you compose a newsletter. Keep 3 forms on your site and watch the subscribers’ statistics. Note which list has more subscribers and leave the appropriate form on your site.